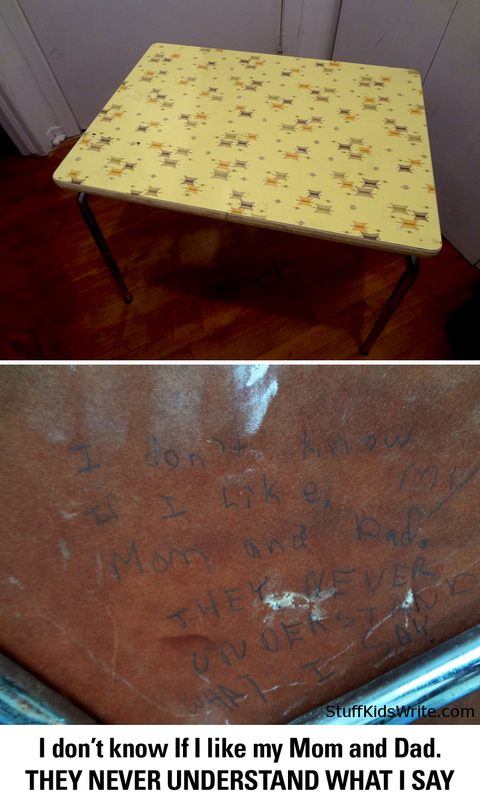 Sometimes kids write in strange places. I found this note while moving. I’ve had that table for about 8 years and never knew it was there! The unanswered question: Who wrote this? Based on the sentiment expressed, we can at least narrow it down to only those kids who’ve ever had parents. Posted on October 16, 2012, in For Dads, For Moms, Views of Adults, Writing in Weird Places and tagged children writing, funny, funny cards, funny kids writing, funny writing, Humor, kid writing, Stuff Kids Write, writing under tables. Bookmark the permalink. Leave a comment.